The Insulin pump is an electronic medical device in use for managing of insulin to control diabetes mellitus. It has the size of a small cell phone, and well known for subcutaneous or applied under the skin supply of insulin through slow injection of insulin into vein or tissue. An insulin pump is an option to recurring daily injections of insulin by syringes or an insulin pen and allows for intense insulin treatment when used in conjunction with blood glucose monitoring and carb counting. It is worn on the belt or put in a pocket. The pump discharges fast-acting insulin into the body using a small flexible pipe (catheter) that pierces with the tiny needle(cannula) entering the fat or the tissue nearby the belly and taped there. Use of insulin pumps gets preference because of: – Smooth delivery of multiple insulin injections for those using intensive insulin treatment. Accurate delivery of small boluses, helpful for infants. Growing support amongst doctors and insurance companies due to the advantages contributing to reducing the incidence of long-term complications. Improvements in blood glucose monitoring. New meters work on smaller drops of blood, and the similar lancet poke in the fingers is smaller and less painful. These meters also adds alternate site testing for the most routine tests for practically painless screening. That replaces the need for pump users to check blood sugar more often. The Insulin Pump is not an artificial pancreas (because you still have to monitor your blood glucose level). Some people achieve better control while using the insulin pump. Many people prefer this continuous system of insulin delivery over injections. The delivery system most closely resembles the body’s natural release of insulin. 1) It works continuously and is so programmed by health professionals that a little amount of insulin as per the need to keep the sugar level in the required range. The release rate is called the’ basal rate”. It releases a small amount of insulin, like the pancreas on a continuous basis. While using the insulin pump one need not measure the insulin as in the case of a syringe. 2) Also, it can deliver wave dose or as called Bolus dose as desired around the meals time. With the advent of information technology applications, the new pattern of settings can get easy commands for tackling the numbers of grams of carbohydrate one eats. Insulin pumps have bolus calculators that help you determine your Bolus value based on settings that are decided by the healthcare professional. The settings can get adjusted for the doses of insulin taking care of the amount of food or exercise. – The quality of life (QOL) in both type 1 and insulin requiring in type 2 diabetes improves when compared to using other methods of management of insulin. – The rapid-acting insulin for the basal needs allows relative freedom for the fixed meal and exercise required that are necessary for controlling the sugar with slow-acting insulin. -The insulin pump is adjustable for the different basal rate as desired in the course of the day or night. It can even adjust to control events like dawn phenomenon. The dawn phenomenon results in less low blood sugar throughout the night. – Bolus rate gets easily used by the insulin pump as it is less cumbersome than syringe injection. – Insulin pump makes possible to deliver exact dose amount than needle injection. Therefore, in the long run, it is cost saving when compared daily multiple doses. Also, a tighter control is exercised to control blood sugar and hemoglobin A1c level thus reducing the chance of long drawn complications associated with diabetes. – The latest smart pumps have what is called ‘bolus wizard’ that finds out the amount of bolus insulin needed taking into account the predicted carbohydrate, blood sugar level, and still-active insulin. – The computer gives out graphed, and trend analysis as the new insulin pump keeps records to feed the amount of insulin usage. – Neuropathy is a troublesome development of diabetes resistant to conventional treatment. There are reports of alleviation or even total disappearance of resistant neuropathic pain with the use of insulin pumps. – More flexibility: Tighter control, fewer long-term complications. – With more precise insulin delivery, one can also gain better control of diabetes. With proper insulin pump use, you can be four times more likely to achieve your target A1C and usually reduce the low blood sugars by 84%. Because insulin pump therapy can you can reduce long-term complications of diabetes such as nerve damage, kidney, heart, and eyes. – Better predictability: Insulin pump therapy provides better predictability in the way insulin works on the body. Traditional, long-acting insulin can gather under the skin, resulting in uneven absorption rates causing unpredictable lows and highs. Insulin pumps use just the rapid-acting insulin, which is absorbed with more predictability so one can deliver smaller, precise doses of insulin when that’s all your body needs. – Insulin pump and accessories cost much higher (over $ 6000) than syringes. – Another unavoidable downside is the occurrence of diabetic Ketoacidosis (DKA) in the case of failure. An inadequate functioning of the pump may be the result of battery discharge, or the insulin reservoir runs dry making the tube loose and insulin leaks than being injected, or the cannula becomes kinked in the body thus preventing the delivery. Thus, it becomes necessary for the user to frequently check and monitor the blood sugar to verify the validity of the insulin delivery. – The users need ways and means to counteract any damage that may take place by the pump and the accessories like the ‘ infusion set tubing’ due to physical activities like sports or swimming. Donning the insulin pump all the time becomes uncomfortable. – The user of the insulin pump has to pay little extra to have a second standby insulin pump in case of failure. They have to resort to injections by syringes in the event of failure of the pumps. – The scar may develop around the place of the cannula. The skin produces a hard bump around the inserted cannula. The scars may be too many after years of use of the cannula and make it difficult for the wearer to find another spot. The spot around the long time insertion mark develops lower insulin sensitivity thereby affecting both the basal rate and also the bolus amounts or both. In a rare case, one has to change the site as the insulin delivery will appear to have no/little impact on lowering blood glucose levels, and the site must be modified. – The allergic reaction to adhesive tape is different for every other person and varies with different brand of the insulin pump used. – A larger quantity of insulin may be needed to use the pump. Many units of insulin can get “wasted” while refilling the pump’s reservoir or changing an infusion site. The process may affect formula and dosage information. 1) A pump has the control, processing module and batteries. Reservoir: A plastic cartridge that contains the insulin gets locked into the insulin pump. It comes with a command guard (blue piece at the top that gets removed before inserting the reservoir into the pump) that helps with pulling the insulin from a vial into the reservoir. A tank can hold up to 300 units of insulin and is changed every two to three days. Infusion Set: An infusion set comprises a thin tube that goes from the reservoir to the injection site on your body. The cannula gets inserted through a small needle that gets taken off after it is in place. It goes into places (areas) on your body similar to where you give insulin injections. The infusion set is changed every two to three days. Infusion Set Insertion Device: An infusion set gets placed into the insertion device, and with a push of a button, the infusion set gets inserted quickly and easily. 2) A use and throw container with insulin. 3) A disposable infusion set having a thin tube inserted into vein or body cavity to manage the insulin. When the time arrives to select an insulin pump, there are numerous options. The “perfect” pump varies by person. Factors are: weight, color, cost, cannula insertion angles, unique features, and easy usage plays a vital role in the collection process. Patient factors related to infusion set selection include patient’s age, immune system function, body characteristics, activities, personal preferences, and history of diabetic ketoacidosis. 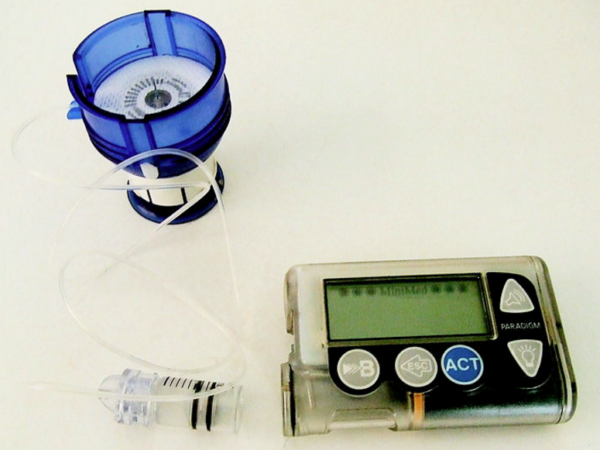 Other types of insulin pumps are possible. For instance, latest models may have disposable or semi-disposable designs for the pumping set up and may do away with tubing from the infusion set.